Do you worry about seeing the dentist? Does your anxiety level start to rise, even when you set up an appointment? David C. Montrz, DDS, PA & Associates in Pearland have a solution: sedation dentistry. Most of us get at least a little nervous before an appointment. For some people it’s more than that. It may be because you suspect you have new cavities, or worry about the idea of drilling, but for such patients, the anxiety is in overdrive. 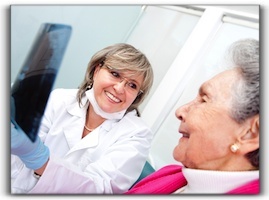 With sedation dentistry at our Pearland or Friendswood office, we’ll put you at ease. Laughing gas has been in use at dental offices across America for more than a hundred years. Once it’s administered, probably won’t make you laugh (you never know, though), but most patients are put at ease within a few minutes. Afterward, it wears off quickly and there are no side effects, so you’ll be able to drive yourself home. For patients who need a little more than laughing gas, the next level is oral conscious sedation. We prescribe a sedative that you take an hour before your scheduled appointment. Most patients are awake through the entire procedure but don’t remember anything. Since this is the next level of sedation, it’s more powerful – and you’ll need a ride back home. IV Sedation is for those patients with dental phobia, have a medical issue, or want to complete a series of treatments in a single visit. At this level, the patient is completely out. It is administered by professionals and is perfectly safe, but again, you will need a ride home when it’s over. At David C. Montrz, DDS, PA & Associates, we also practice general dentistry and cosmetic dentistry. Call today to see what we can do for you.